In the world of fine art photography, some artists take or make photos, others create them. The “takers” are those such as Dorothy Lange who record and document reality in its many forms and with a minimum of manipulation to extraordinary effect. The “makers,” including portrait artist Diane Arbus, are notable for their staging, lighting and composition, all the product of the studio and darkroom as much as their camera expertise. As for the “creators,” though not necessarily more fine or artistic, they are nonetheless more experimental with their medium. The result is often work that is more conceptual and/or abstract. A few have even created “photos” that are transcendent, without the use of a camera. 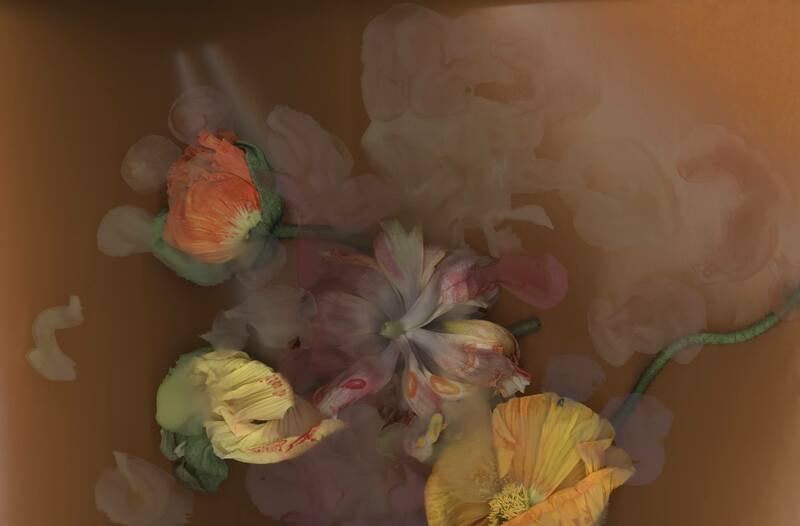 But, while the above images were made largely by placing objects atop light-sensitive photographic papers, Simons creates her “scanograms” by layering floral arrangements directly on the bed of her scanner. The image may take hours, even days to scan and print to the monumental size she favors. All of which can be seen in Simons’ most current exhibition, Stockage, in the Garden of the Zodiac gallery in the Old Market Passageway through August 17. Stockage is composed of five large, digital format scanograms, one smaller one in extreme close-up, a series of three glass-enclosed wall hangings of seeming scientific flora specimens and an imposing, beautifully rendered, floral folding screen. Patrons of the Moving Gallery, which sponsored this exhibit may also recall its extraordinary 2010 exhibition, Time, Death and Beauty, organized by Berlin’s Matthias Harder, the curator of the Helmut Newton Foundation. It too featured, among other international photo artists, the work of Simons and Omahan Vera Mercer. In general, Mercer’s prints have evolved into still lifes of flora and fauna, mostly game, and vessels of all sorts that despite their formal properties appear quite visually intuitive and romantic. To the contrary, Simons’ aesthetic is more conceptual and referential. The content of Stockage is mostly tulips and to a lesser degree, poppies, each with an interesting cultural history and symbolism that contribute highly to her vision. Objectively, Simons connects to tulips’ history as commodity in the global market as they moved from Asian to European markets and beyond in a sort of “tulipomania” in 17th century Holland. At the height of “tulipomania” in March, 1637, tulip bulbs sold for more than 10 times the income of a skilled craftsman. And, it has been recorded that this phenomenon became one of the first “economic bubbles” in history. Not only does one see that intensity in Simons’ tulip imagery, but true to the theme of Time, Death and Beauty, her blossoms often appear rootless, ephemeral and on the verge of bursting, albeit with great beauty and sensuality. Poppies also symbolize a similar polarity culturally as the source of powerful opiates and their subsequent addiction. Yet, poppies are too a symbol of sleep and peaceful death, and what’s more, in classical mythology, their vivid red color signifies resurrection after death. The cultural and socio-political background of such is interesting, but in Harder’s essay, “Mysterious Dangerous Beauty, that accompanies Luzia Simons, a book of her “Stockage” prints, he reminds us that her series of floral images is also personal as well as conceptual. The artist accomplishes this not only by scanning her flowers at peak color, in close-up, and larger than life, but by her arrangements and composition that eschew bouquets or potted plants. Petals and stems are ‘stockpiled” atop the glass and often create their own images as they bloom, fall and separate in the scanner’s heat. Furthering the drama of the “moment” are: high definition detail and palette saturation, a selective field of focus which enhances spatial depth, predominantly dark backgrounds and high contrast lighting that make some flowers appear to pop from their canvas as others wilt from view. In addition, Simons lends some images an illusional quality by having pollen fall onto the scanner plate thus creating a ghostly tone in sharp relief to the more sculptural-like work in this exhibit. Very little of this variation is first observed by the viewer so intense are the qualities of light, shadow and color that permeate the gallery. The larger scanograms dominate -–captivate, really—one’s attention and hold the exhibit together. The smaller works, as well as the mural-like screen, though respectively clever and accomplished, are nearly distractions; at best, addendums to Simons’ talent and Stockage’s intent. As such, the exhibition’s monumental works, which break from traditional photograms, as well as photographs, appear to reference by category the tri-partite theme of Time, Death and Beauty, and in that order. Seen this way, “Time” measures the two most traditional and formal images in the exhibit, Stockage #151 and 152, both in the back gallery. “Traditional,” because these flowers are at their most beautiful in blossom, enjoying their brief time in the sun or spotlight. These images are the closest to formal arrangements or still lifes in the show, the most exquisite combination of the real and the ideal. Viewers of these tulips in the category of “Time” are more likely to say, “These are the flowers I know. I’ve seen them in nature or on a pedestal.” On Simons’ canvas, they bloom into sight, not because of an artificial black backdrop, but because of the high def, key lighting and multi-reflective, layered background. A moment of harmonious, natural beauty. Representing “Death” in the thematic trilogy are the tulips in Triptych, #45 in the hallway separating the two main gallery spaces, which offer flowers in sharper contrast on solid black backgrounds not unlike in the 2010 exhibition. Rather than pop, these petals look as if stamped or stapled to the surface as if specimens to their now past glory. Instead of a bouquet of tulips, they resemble more a collection whose blood rich reds on an ebony backdrop have been augmented by the artist who actually paints, touches up as it were, with a bit of pigment on the scanner glass. Not even this additional make-up can quite cover up flower edges that have begun to curl and fade over another layer of pasty white and gray petals hinting at what’s to come. Lastly, Simons’ interpretation of “Beauty” is not categorized by work of traditional floral arrangements as we have seen in works, #151 and 152. Instead of tulips fully blossomed, we have in pieces #149 in the front gallery alcove and especially #150 in the back venue space, art work that is fully blossomed. That is, scanograms that are the most painterly whose images of tulips are the most gestural, abstract and ephemeral. This is Simons’ most complex work to date. The palette is now a pastiche of translucent yellows, reds and greens on a fairly neutral, liquid background. It is no longer about tulips as commodity or even subject but as inspiration. Thanks to her creativity, their Beauty will endure. The tulips no longer pop. They linger. Stockage will “linger” until August 17 in The Garden of the Zodiac gallery in the Old Market Passageway. For details and gallery hours, call 402-341-1910.